John Herschel discovered this nebula on June 8, 1837 from the Cape of Good Hope, and cataloged it as h3682 in his 1847 catalog. It became GC 4297 in his General Catalogue of 1864, and NGC 6357 in J.L.E. Dreyer's NGC. 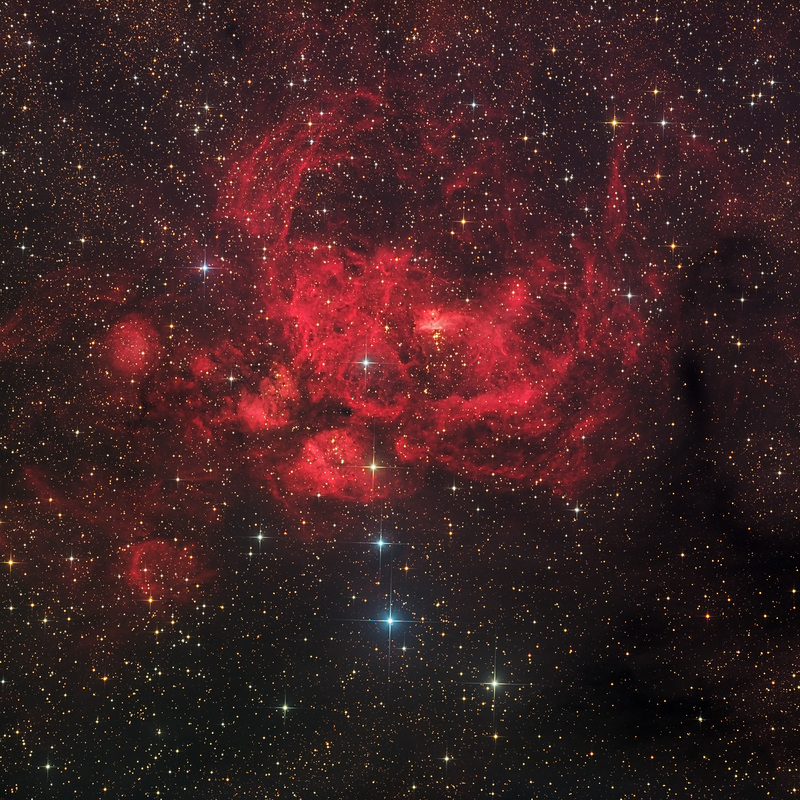 NGC 6357, is a diffuse nebula in the constellation Scorpius. 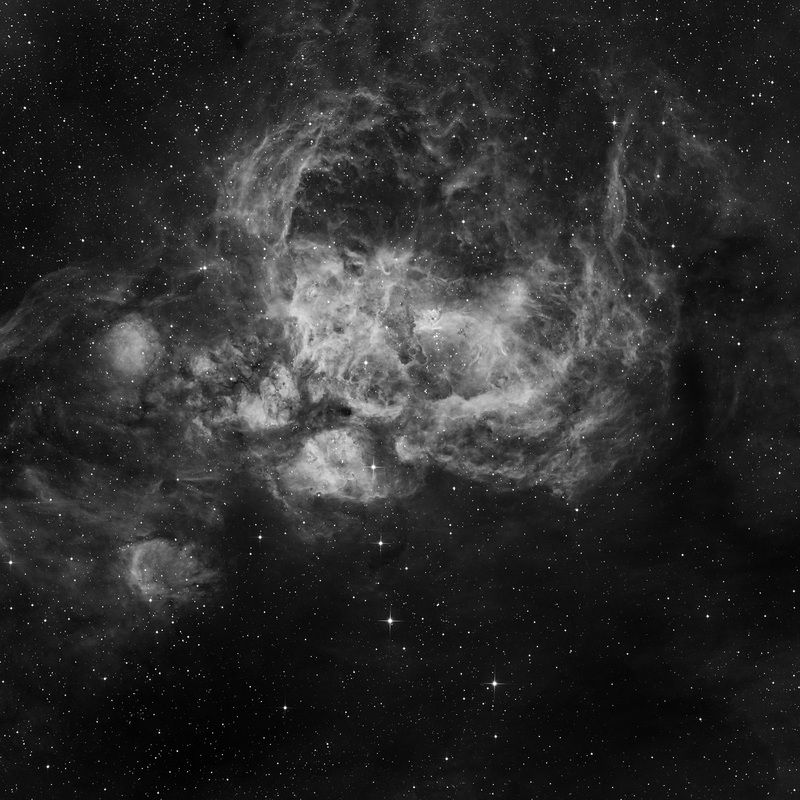 The nebula is ionised by the star cluster Pismis 24 which includes the massive multiple O4 and O4-5 star system as well as the Wolf-Rayet star WR 93, which is also a multiple star system with a class O7-9 companion. 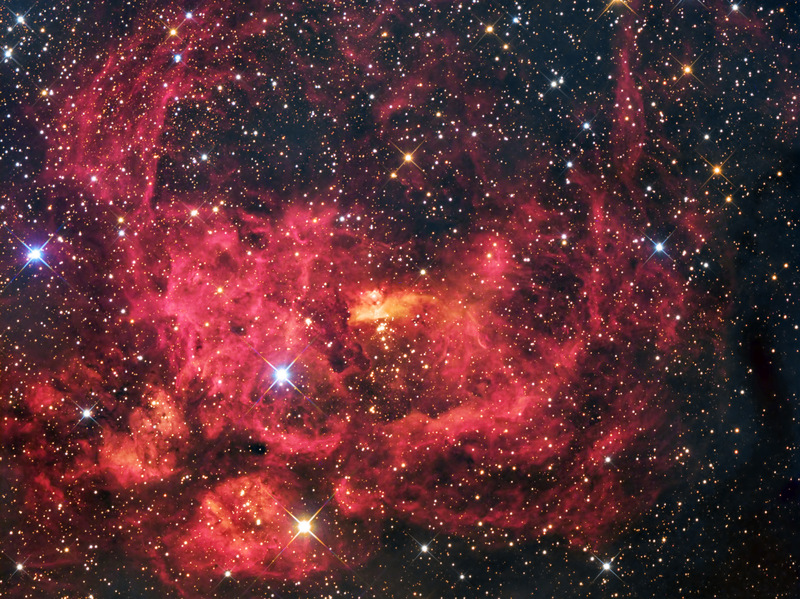 The overall red glow near the inner star forming region results from the emission of ionized hydrogen gas. The intricate patterns are caused by complex interactions between interstellar winds, radiation pressures, magnetic fields, and gravity. NGC 6357 spans about 400 light years and lies about 8 000 light years away. The star-forming nebula NGC 6357 show no evidence of a blue component in its colour. The frame taken with blue filter had no nebulous image at all, only a few traces. Such an object is excellent example of the phenomenon known as 'interstellar reddening', the selective removal of blue light by trifling particles of dust. This accounts for both the ruddy hue and apparent absence of blue stars. The hot stars are present but only some of the red part of their light is seen so they are not conspicuous. 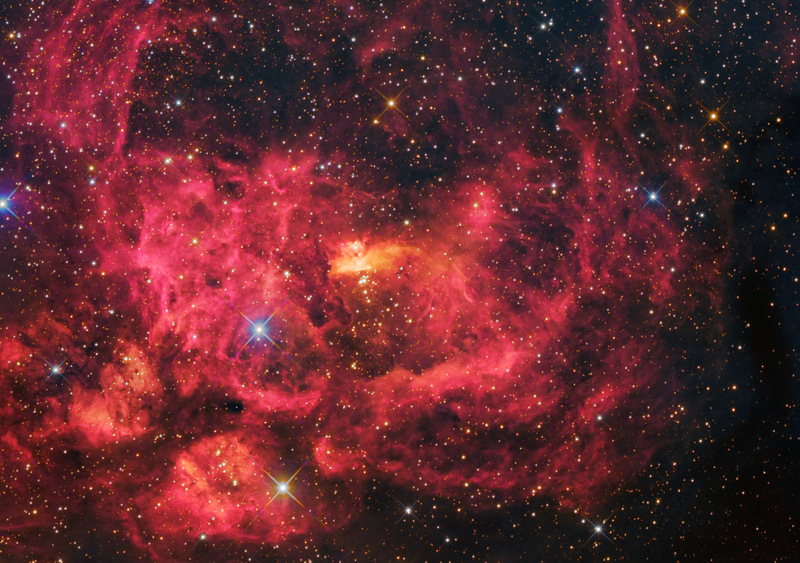 Pismis 24 - This nebula includes the open cluster Pismis 24, which is home to several massive stars. One of the brightest stars in the cluster, Pismis 24-1, was thought possibly to be the most massive on record, approaching 300 solar masses, until it was discovered to be at least the triple system with each star exceeding 70 solar masses.